The only person on this list that I haven’t heard of is me. It’s a pretty big honor to be included, to be honest. You can learn more about the book here: The Post-It Note Diaries. This link will show you a sample chapter by John Hodgman. There’s going to be a release party and show next Tuesday, September 27th at Littlefield in Brooklyn, NYC. Me, Starlee Kine, Andrew Solomon, David Rees, Hannah Tinti, Daniel Engber, David Wilcox, and Arthur Jones will be reading/performing. 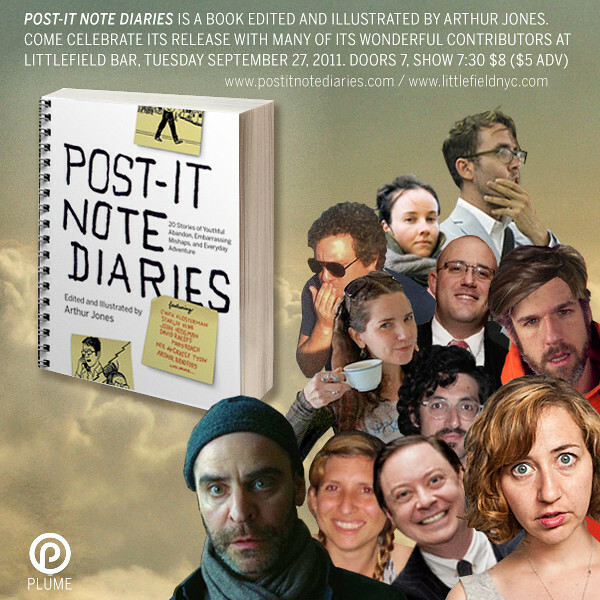 For tickets and info, check this out: Post-it Note Diaries: Book Release & Reading. I hope you guys can make it, or at least read a copy of the book. Buy a couple if you want — use ‘em to hold up the short leg on your couch.